As part of a larger project that covers 1.3 miles near the Daytona International Speedway (The Speedway) in Daytona Beach, Florida, a second pedestrian bridge was installed over US 92 providing pedestrians with safe passage over the very congested highway. Based upon Volusia County's high ranking for bicycle and pedestrian injury due to crashes, and in anticipation of development along this corridor as a year-round tourist destination, the project's timeline was advanced and treated as a Design-Build. According to the National Complete Streets Coalition, Florida has been ranked as the most dangerous of the 50 states for pedestrians. Studies have shown that Daytona Beach has even more pedestrian deaths per 100,000 population than Orlando. "The project was coordinated with the City of Daytona Beach and the TPO [River to Sea Transportation Planning Organization]," Jennifer Horton, a spokesperson for the Florida Department of Transportation (FDOT), wrote in a statement. "The Speedway was also involved in discussions." Installed in 2002, the existing pedestrian overpass — located about 1,200 feet to the west — is a Continental® truss structure provided by Contech Engineered Solutions, and it was decided that the new crossing should match the existing one. For this reason, a 182' x 16' Gateway® style, Continental truss structure was selected as the best solution for the second pedestrian crossing. In addition to the bridge and access ramps, the $18.7 million project included upgrading an intersection, replacing existing sidewalks with wider, ADA compliant sidewalks, and installing landscaping, lighting, sound speakers, fencing and future signage. "As development occurs on the ISB corridor, and it becomes more of a year-round tourist venue, it is important to improve the environment on FDOT right-of-way for the current and the anticipated increase in users," Horton added. With US 92 being utilized by an average of 43,500 vehicles each day, it was imperative that the Continental structure be installed at night to avoid as much disruption as possible to traffic. The bridge was delivered in sections and then assembled on-site so that all of the lighting and other accessories, including custom stainless steel mesh panels, could be added before the bridge was installed. 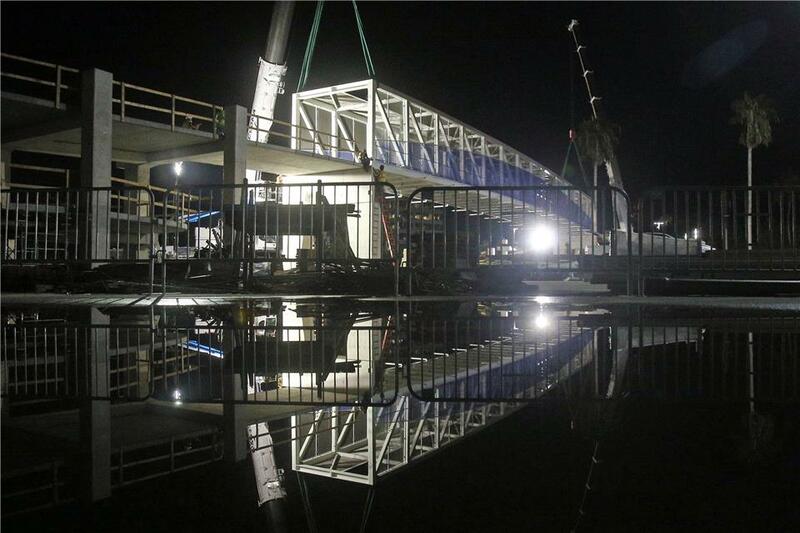 The eight-lane highway was closed for just one night with spotlights illuminating the night as the pedestrian overpass was lifted into place via crane. The new pedestrian overpass opened for pedestrian traffic before Thanksgiving 2015, with the entire project completed on December 15, 2015. The City, County and all Stakeholders wanted to increase public safety of pedestrians visiting the abundance of annual events, while also creating a more uniform and aesthetically appealing look. The new overpass will provide pedestrians with safe passage in an area that currently includes restaurants and stores about a block away from the Volusia Mall. In addition, International Speedway Corp. has announced plans for One Daytona, an $800 million restaurant-retail-entertainment complex, with the first phase opening in September 2017. "The communication and effort made from all parties including local agencies, stakeholders and organizations like the Conklin Centers for the Blind, was absolutely amazing," added Bradley D. Bauknecht, P.E., Project Oversite III with the FDOT. "The Design Build Team proved that anything is possible as long as you work together. The project was under budget and finished early which is the Construction Project Manager’s ultimate goal. My motto has always been, 'Hard work pays off,' and it was without a doubt proven on this project." At the official bridge opening, Mayor Derrick Henry added: "Today, the gateway to the World's Most Famous Beach takes a giant step toward its destiny of maturing into one of the region's safest and most aesthetically appealing corridors."